I’m headed off to Germany to taste wine and see the vineyards in the Rheingau region along the Rhein River near to Rudesheim. This looks set to be a great trip and I look forward to sampling the glories of the area, Riesling and even Spatburgunder, German Pinot Noir. I will also be hiking up the steep hills and check out the vineyard sites, weather permitting of course, to feel the terroir and view the great Rhein River from the slopes. Look for some quick notes and updates, with a full report to follow in June. While I’m in Germany, Brandy Falconer will be continuing her reports from Italy. Thanks for checking to grapelive and look for some more reviews soon. 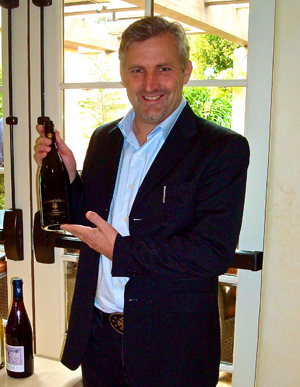 I had met Carmelo Morgante at Vinitaly and was glad to finally see this small but important winery. We first toured the production area and I saw huge stainless tanks, one being worked on to ensure the temperature control system was functioning properly. I could see the insulation between the panels and marveled again at how these tanks can keep the contents cool like a giant thermos in the hot summers, and I realized how enormous the winemaking industry is, with all of the technology needed to create our favorite wines. After that dose of wine-reality, we moved on to the bottling and corking area where I asked Carmelo about the corks, as I like to do with every winery. When I pose the question about synthetic vs. natural, the consensus seems to be that there is still a taboo even within the industry about the switch to synthetic corks. Carmelo said that they will always use natural cork for the Don Antonio, and does not see a change in the use of natural cork for the Nero d’Avola in the near future. He then described how there must be a good rapport between the cork maker and the winery, a relationship of trust which is just another factor in the quality control of their winemaking. Another point to make here about quality control is just how many levels deep the controls go. 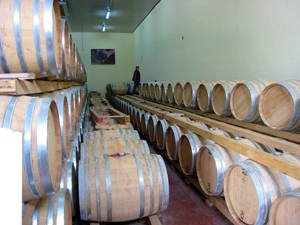 For example, at Morgante, the guides that allow a machine to insert the corks into the bottles can get dirty after a day of processing, even though the corks and the machines are cleaned thoroughly, so as an added protection to ensure consistency and quality, these guides are cleaned daily during bottling. This is certainly not just one standout procedure, and walking around the winery, and others I visited in Sicily, I was impressed by the consistency of cleanliness in each phase of the winemaking process. I personally think that the wineries here are given a bad rap by critics who say that the quality control just isn’t there in the southern regions of Italy, because the professionalism that I experienced here is on par with any of the wineries that I have visited in California. Just because they don’t have fancy visitors centers and tasting areas does not mean they are not serious about their wine, in fact, their efforts are concentrated more on the process than the image. We finished our tour in the modern yet relaxed tasting room adjacent to the offices. 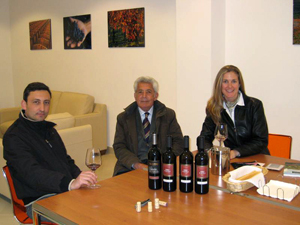 I had the opportunity to taste the Nero d’Avola from 2005, 2006 and 2007, which was a great way to get to know this wine. The 2005 had aromas of amaretti cookies, and an herby cherry flavor and velvety feel. The 2006 had strong herbal and fruit aromas and a flavor just like chewing a mouthful of ripe bing cherries, very juicy and delicious. The 2007 was somewhat more elegant in flavor than the 2006 and perhaps a little less round and full, but possibly because it was also younger. Finally we tasted the 2005 Don Antonio IGT Nero d’Avola, their cru, which is a complex, elegant structured wine that is also quite drinkable with aromas of fruit, licorice and cocoa that will just make you smile. At this point, I was lucky to have the opportunity to meet Carlo’s father, Antonio and talk a little bit about the wine. I found it very interesting to know that Morgante is one of the wineries here who has just recently begun to vinify their own grapes. Though the vines for Don Antonio are between 34 and 39 years old, the first vintage bottled was 1998, whereas previously the grapes had been sold to other producers. I am personally glad they made the switch and took the risk! I was thrilled to have another chance to indulge in traditional Sicilian seafood preparations when Carmelo and I traveled a few minutes to a nearby town to Ristorante Cavaggliere. Though we were enjoying both antipasto and main dishes of seafood, a bottle of Don Antonio was opened, and I was interested to see how everything would match. Our antipasto consisted of I think eight dishes of cold plates of everything from octopus…whole octopus… to shrimp salad, sardines, mussels and more in varying preparations. Then, I had the opportunity to meet the fish I was about to eat when the waiter brought out a platter of uncooked ocean friends for me to choose like a dessert cart. I took another rather large sip of wine and appreciated this new experience, not being one who typically likes to know where the delicious piece of food actually comes from. The mixed grill of seafood and calamari was simple and delicious, and I was shocked at how enjoyable the food was with the Don Antonio. This was an exciting discovery and I would say in wine terms, dates the classic Bond film, “From Russia with Love,” where the villain reveals himself at dinner in his poor choice of Chianti to go with his fish. After a quick goodbye back at the winery and a few photos, I was on my way back towards Catania for my flight the next day. 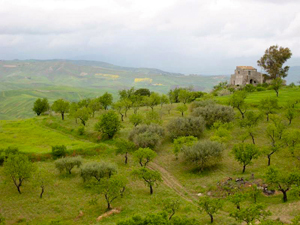 I thoroughly enjoyed the landscape throughout Sicily as it reminded me of California’s central valley and our central coast, with all the ancient charm that more than 3,000 years of civilization and trade can offer. The hospitality and warm friendliness of Sicily really helped me get through four days of rough travel in the rain, and I look forward to returning to see Etna and the beautiful beaches in the Sicilian sunshine. 2007 Robert Craig “Mt. George Cuvee” Napa Valley (Bordeaux Blend).